Rhubarb – such a delicious, yet funny looking word. The longer I spent fiddling wiht and formatting the text in the photo above, the more convinced I became that I had spelt rhubarb wrong, then had to resort to Google to check. Last weekend I’d searched high and low in my patch of West London for some rhubarb which I had to buy for a recipe commission. In my local shops and regular supermarket there was none to be found. Eventually I visited a different supermarket and was disappointed to discover that their rhubarb was Dutch rather than British; reluctantly I put two packets into my basket, picked up some green vegetables for smoothies, and then happily discovered some rhubarb in the reduced section that was British and also from Kent. Win, win, win for my wallet, food miles and for British food! Buying local food is something that we struggle with living in central London. There are some farmers markets, but it is not really that local. I compromise by looking for British produce; preferably from the home counties – but it is complex – most supermarket produce, even loose items come with some sort of plastic packaging in the crates, in the market by and large the produce comes out of a cardboard box, I buy by the scoop and carry home in a reusable fabric bag. No plastic, but more food miles and certainly far cheaper. Rhubarb needs very gentle cooking, over-cook it and it will completely disintegrate, under-cook it and it is tart and sour, it goes from under to over cooked in a matter of seconds making it a perfect candidate for sous vide experimentation. 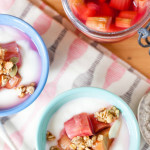 This worked a treat – perfectly cooked and flavoured rhubarb which retained its shape and had some texture and bite once cooked. I added a tiny piece of Thai ginger and a sliver of lemon zest (I’d usually use orange but the fruit bowl was nearly empty) to the sous vide bag; the nature of sous vide cooking intensifies flavours, so go easy and add far less than you would normally do. For a more classic rhubarb compote use orange zest and omit the ginger. 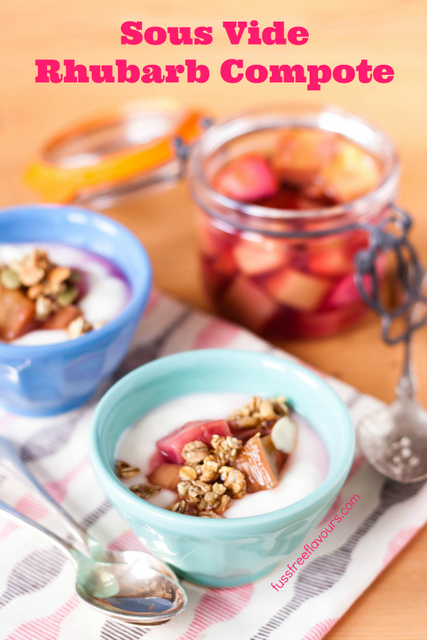 Once cooked, store in a jar in the fridge and enjoy with natural yoghurt, or with cereal or porridge for breakfast. 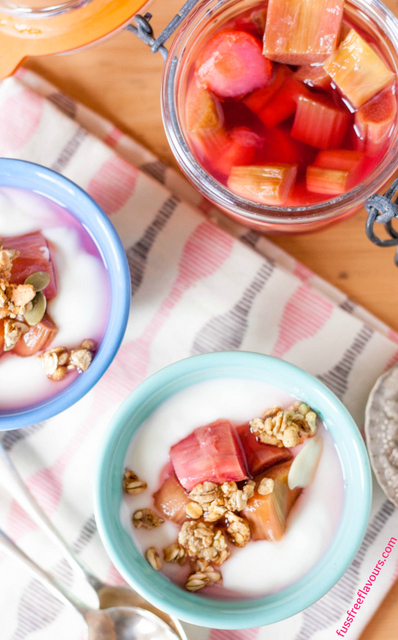 If you try this Recipe: Sous Vide Rhubarb Compote please tag #FussFreeFlavours on Instagram or Twitter. It is amazing for me when for me when you make one of my recipes and I really do love to see them. You can also share it on my Facebook page. Please pin this recipe to Pinterest too! Thanks for reading Fuss Free Flavours! Delicious and easy to make compote with a hint of ginger heat. Place all the items into a sous vide vacuum bag and seal. Cook at 60C / 140F for an hour. Once cooked cool in a basin of cold water and transfer to a jar to store in the fridge.